Previously: "Joey's Hope - Part 1 of 4", "Joey's Hope - Part 2 of 4", and "Joey's Hope - Part 3 of 4"
...Because this was an exciting brand new medication the local news station interviewed Joel several times throughout the twelve week treatment period. The video clips of the news stories, where Joel and Kimberly themselves talk about the Mayo Clinic and Yervoy, can be found at www.indianasnewscenter.com. Joel had subsequent Yervoy treatments, and the side effects were not too horrible until he became so dehydrated that he had to make a trip to the oncology office to be hooked up to an IV for fluids, every day for five days in a row. The worst side effect was diarrhea, and he did have it for approximately four months straight! After the very last treatment he got worse. Over July fourth weekend he was hospitalized and remained there for eight days. It was possible that the Yervoy could create perforations in the intestine and could ultimately become fatal. Fortunately, this did not happen with Joel’s treatment. Dr. Carr is part of Fort Wayne Medical Oncology and Hematology (FWMOH), which wrote a story on Joel and have it posted on their website at www.fwmoh.com where you can go and read more about their experience with Yervoy. Upon release from the hospital in July 2011 Joel slowly healed and steadily became stronger. A full body PET scan was scheduled for July 28 and Joel received the results one week later on August 4, 2011. This was two years exactly to the day in which he had the initial surgery and biopsy to remove the suspicious lump from his neck. The results were not what was expected. They could NOT FIND any cancer in Joel‘s body! The PET scan showed NO CANCER anywhere! Joel was in remission at this time! Praise the Lord! This was not what the doctors expected. It was thought that the Yervoy would shrink some of the tumors….but to have all 25 of them gone was astounding! Completely gone! It was truly a miracle from God! Joel continued healing and feeling stronger. He had some memory problems, some balance problems, weakness, severe fatigue, some depression, shaking, lack of strength, and other problems due to all of the surgeries, aggressive treatments, radiation, chemotherapy, and other things that were done to his body. A human body can only take so much. The oncologists won’t change Joel’s status from “terminal, stage 4” cancer, and he will never be able to return to work. This cancer is aggressive, and we were told it will return. Joel continued seeing the oncologist in his hometown for follow-up visits to keep an eye on his blood levels and his liver. The side effects from the Yervoy can last many months after the last treatment. Then on December 12 another full body PET scan was done. Joel and Kimberly would receive the results on December 22, just three days before Christmas. They kept a positive attitude, kept their focus on the Lord, set a good example for their daughter, and enjoyed the holiday season. They trusted that no matter the results, God’s will be done. Joel and Kimberly realize that the statistics showed the cancer returning after a short period of time in clinical trials. They accept the fact that this cancer will ultimately return and take Joel’s life at an early age (he is 47 years old by now). They enjoy life to the fullest every day, encouraging others to trust in Jesus during the dark valleys of their lives. They share with everyone that it is indeed possible to enjoy life while struggling through a crisis situation, especially when you have a huge support system of family and friends, and when one completely places their trust in the Lord. On December 22, 2011 Joel and Kimberly sat in Dr. Carr’s office excited, nervous, and very ready to receive the PET scan results. Dr. Carr advised that Joel remains in remission! Somehow Joel is still cancer free! This is truly and positively a huge miracle! The Yervoy has worked on Joel much better, and much longer, than expected! 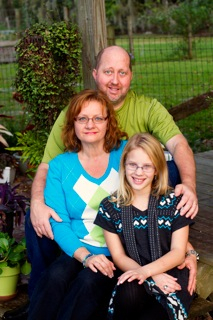 Joel’s next full body PET scan will be in April or May of 2012. Joel and Kimberly are abundantly enjoying each and every day with family and friends, all the while knowing that God has a perfect plan for their lives and they trust in Him. Had the doctors at the Mayo Clinic in Rochester, MN not told Joel about the new treatment, which was scheduled to be released for use in the United States in a few weeks from that date...Joel would not be with us today! The Mayo Clinic saved Joel’s life when they performed brain surgery in April 2010 and again in April 2011 when they suggested he try a brand new treatment, not even available yet. Joel and Kimberly are indebted forever to the medical professionals at Mayo Clinic in Rochester, Minnesota. Without the Mayo Clinic the little Saunders family would not be delighting in the beauty of God’s creation every single day…..all three of them, together.